The theme of the absurdity of war, or the absurdity in war, is one that has been touched upon a few times over the years, most notably with CATCH-22 (WWII) and M*A*S*H (the Korean War). This time around, the film A PERFECT DAY looks at the Bosnian War through the eyes of a small group of aid workers who were sent there in the conflict’s closing days to try to bring some semblance of everyday life back to the survivors. 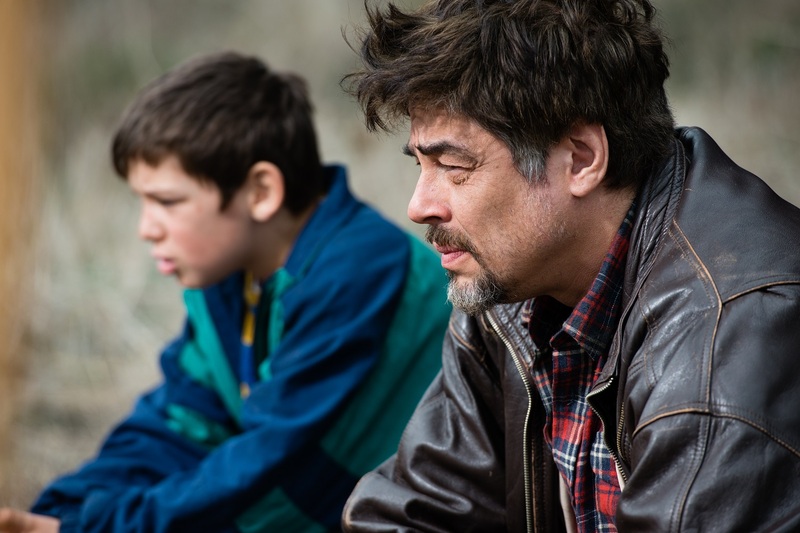 Set “somewhere in the Balkans” in 1995, Mambrú (Benicio del Toro, SICARIO) and B (Tim Robbins, MYSTIC RIVER) are a pair of battle-hardened, logistics workers for the fictitious Aid Without Borders. They have clearly been around the block more than a few times, and their approach to their daily trials and tribulations reflects their weariness. The film opens with Mambrú and his local translator, Damir (Fedja Štukan) trying to hoist a corpse out of a village’s well. Whether the body was put there for payback or to force the villagers to pay extortionate prices for clean water is not clear, but for the aid workers it doesn’t matter. If they don’t get it out quickly, the water supply will be poisoned. When their rope breaks, Mambrú calls B to try to find him another one but that’s no easy task. Although a ceasefire has been signed, no one on the ground cares. There are still scores to settle, last-minute territory to grab and general disdain for foreigners, who are seen as an unnecessary nuisance. What should be a simple task quickly becomes a Sisyphean adventure involving a neophyte colleague, a couple of dead cows, a past flame, UN bureaucracy and a local boy whom Mambrú saves from a bunch of gun-toting bullies. Based on the novel, “Dejarse Llover” (Let It Rain) by Paula Farias, A PERFECT DAY is the first English-language film by Fernando León de Aranoa, who also directed the 2002 film, MONDAYS IN THE SUN, starring Javier Bardem. It received a standing ovation when it premiered at the Directors’ Fortnight at Cannes last year. As the former president of MSF Spain, Farias knows too well how frustrating it must be to try to do good work in an area where the peace is fragile at best. The first half of the film moves very slowly as we get to know the aid workers’ personalities, their relationships (present and past) and their working conditions. If you can get past that, the story’s second act does reward. Del Toro and Robbins are enjoyable to watch as they navigate through the bureaucratic and physical minefields that are imposed upon them, however their wisecracking humour comes at the expense of the film’s two female characters, Sophie (Mélanie Thierry, THE PRINCESS OF MONTPENSIER) and Katya (Olga Kurylenko, THE WATER DIVINER and TO THE WONDER), who simply play the guys’ foils. With its hard rock soundtrack blasting as the team cross-crosses the countryside in search of that elusive rope, it’s easy lose sight of the price that war extracts from the innocent. Sadly, that reality is brought to the fore when the team enters a deserted town. War may be absurd but it’s also lethal. While it is not in the same league as its “war is crazy” counterparts, A PERFECT DAY is a mildly entertaining film… if you can sit through the first 45 minutes.